Cabinet hardware has a huge impact on the overall look of your kitchen. Changing your hardware is a great way to update your kitchen without a big investment of time and money. The hottest hardware craze not yet seen everywhere is square bin pulls for drawers and cabinet latches for doors. These looks pair perfectly with a modern farmhouse décor. 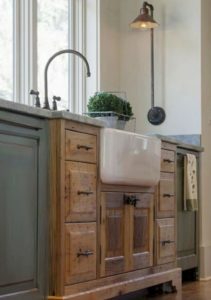 Trending drawer pulls are more traditional than the usual long, skinny handles, and although latches are not the most practical, they are great accents for undersink or pantry cabinets. Finishes in brass or silver give this heavier hardware a rich, timeless style. Learn more here.